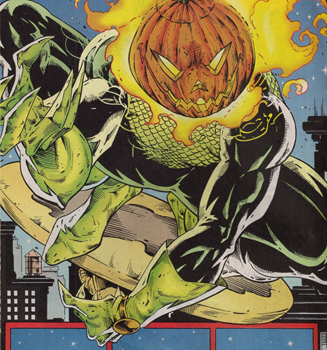 Aliases: Quentin Beck, "Buddy", "Chuckles", "Fish Bowl Head", "Handsome", "Jack", "Jackie-Boy", Jack O'Lantern, "Jackson", "Laughing Boy", Mad Jack, "Mystie", Spider-Man, "Spidey", "the Wizard of Oz"
Powers/Abilities: A stuntman by trade, Mysterio received special effects, chemistry, and robotics training under Quentin Beck, his predecessor. He also studied ancient mind-control and hypnosis techniques. His equipment worn as Mysterio includes a device creating the illusion he's headless, electricity-firing blasters in his gauntlets, and robotic bats and snakes hidding throughout his suit. Mysterio also employs a number of hallucienagenic gases able to be emitted from his suit. Mysterio's boots are equipped with magnetic plate springs allowing him to leap great distances, while his helmet has a built-in sonar that can disrupt Spider-Man's spider-sense. He also uses a hover-disc to simulate flight, a device first employed while acting as Mad Jack. Mysterio has also used a "joy juice" that negates super-powers, and "happy tanks" that create realistic virtual reality environments. While acting as Mad Jack, Mysterio wore a helmet covered with simulated flames, was able to shoot flames from his gloves, and used a series of weaponized candles, including one able to drip hallucinagenic wax. Mad Jack was joined by a robot cat controlled by his partner Maguire Beck. As Mysterio he kept the cat for a brief period where it was active under it's own control before discarding it. History: (Amazing Spider-Man I#141/Official Handbook of the Marvel Universe A to Z Vol. 8 (Mysterio (Berkhart) (fb)) - Daniel "Danny" Berkhart was employed as a motion picture stunt-man. (Spider-Man: Mysterio Manifesto#2 (fb) - BTS) - Berkhart apparently worked with fellow stuntman and special effects artist Quentin Beck on a few low-budget "creature features". (Spectacular Spider-Man II#257 (fb) - BTS) - Berkhart was a regular at Maguire's Irish Pub in New York until it's closing. (Amazing Spider-Man I#141/Official Handbook of the Marvel Universe A to Z Vol. 8 (Mysterio (Berkhart) (fb)) - Berkhart was blacklisted from the film industry after arriving for work drunk. (Amazing Spider-Man I#198 (fb) - BTS) - Imprisoned for an unrevealed crime, Berkhart was selected by Beck, by then better known as the illusion-casting criminal Mysterio, to be his cellmate prior to his second arrest. (Amazing Spider-Man I#141/Amazing Spider-Man I#198 (fb)) - Eagerly greeting Beck, Berkhart believed he was being taken under his cellmate's wing while Beck, thinking of Berkhart as a greedy fool, plotted to have him assume the identity of Mysterio. When Beck taught Berkhart enough of his secrets he faked an escape attempt that ended with his seeming death by gunshot. (Amazing Spider-Man I#198 (fb) - BTS) - Berkhart was released from prison a year later and immediately went about becoming Beck's successor as Mysterio (freeing Beck to pursue his own schemes unabated). (Amazing Spider-Man I#141/Amazing Spider-Man I#142 (fb) - BTS) - J. Jonah Jameson hired Mysterio to eliminate Spider-Man. (Amazing Spider-Man I#141/Amazing Spider-Man I#142 - BTS) - Spotting Spider-Man while he evaded the New York Police Department in his Spider-Mobile, Mysterio used Spider-Man's proximity to his lair to create an illusion that convinced Spider-Man he was driving in an alleyway when he was actually driving off of a pier into the Hudson River. While the accident ensured Spider-Man's freedom from arrest, the Spider-Mobile was lost. (Amazing Spider-Man I#141 - BTS) - Mysterio contacted Jameson at his private club to inform him of his progress. (Amazing Spider-Man I#141) - Locating Spider-Man outside of a McDonald's restaurant, Mysterio used his fog to disorient him before attacking. Taking note of Berkhart's speed, strength, and curious lack of Mysterio's trademark melodramatic taunts, Spider-Man realized he was being led into a trap and narrowly avoided being struck by a truck (apparently driving on the side of a building) before being attacked by numerous members of his rogues gallery. While Spider-Man injured himself fighting the illusions, Mysterio taunted him, telling him this was just the beginning. (Amazing Spider-Man I#142) - Confronting Spider-Man while he attempted to salvage the Spider-Mobile, Mysterio boasted that nothing would stop his revenge, not even his seeming death; planting an image inducer on Spider-Man, Mysterio vanished. After suffering through several illusions in his civilian identity of Peter Parker, Spider-Man discovered the image inducer and tracked the transmission to Mysterio's lair by the Hudson River. Attempting to frighten Spider-Man by pretending to be headless, Mysterio was overpowered by Spider-Man who saw past the illusion. Losing his temper, Msyterio leapt at Spider-Man, but was knocked down and restrained with webbing. (Amazing Spider-Man I#142/Amazing Spider-Man I#143/Official Handbook of the Marvel Universe A to Z Vol. 8 (Mysterio (Berkhart)) - As Spider-Man removed an electronic mask that created his headless illusion, Mysterio, paniced following a swift and unexpected defeat, revealed his connection to Quentin Beck and how he took up his mantle following his apparent death, as well as how a number of his feats were accomplished. (Amazing Spider-Man I#142) - Taken into police custody after Spider-Man alerted the police to his whereabouts, Mysterio called Jameson to demand he provide him with a lawyer. Threatening to expose Jameson's role in his actions, Mysterio hung up on him; his words had little effect on Jameson, who instead left town to avoid dealing with Berkhart. (Amazing Spider-Man I#143 - BTS) - Spider-Man blamed the effect Mysterio's illusions had on his sanity when he spotted a woman identical in appearance to his deceased girlfriend Gwen Stacy. (Official Handbook of the Marvel Universe A to Z Vol. 8 (Mysterio (Berkhart) (fb) - BTS) - Left to handle his legal affairs solo, Berkhart was sent to prison. After completing his sentence, Berkhart learned that Beck resurfaced (having faked his earlier demise). Apparently taken under Beck's wing for real this time, Berkhart learned a greater detail of his predecessor's trade alongside fellow protégés Conundrum and Beck's young cousin Maguire. (Spectacular Spider-Man II#257 (fb) - BTS) - Beck, considered to be the master by his protégés, told Berkhart that his romantic streak would be the death of him. (Spectacular Spider-Man II#240/Spectacular Spider-Man II#256/Spider-Man: The Mysterio Manifesto#3/Official Handbook of the Marvel Universe: Spider-Man: Back in Black I#1 (Conundrum)/Official Handbook of the Marvel Universe A to Z Vol. 8 (Mysterio (Berkhart) (fb) - BTS) - Conundrum left to pursue his own goals, inciting a fierce rivalry between him and Berkhart, who, with Maguire's assistance, took up the mantle of the Jack O'Lantern (preferring to call himself "Mad Jack" to differentiate himself from the others to have taken up that role). Affecting an Irish accent as part of his new identity, Berkhart was joined in the field by Maguire via a remotely operated black cat. (Spectacular Spider-Man II#248/Official Handbook of the Marvel Universe A to Z Vol. 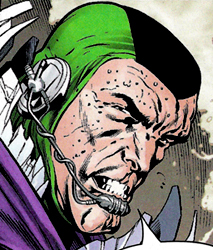 8 (Mysterio (Berkhart) (fb) - BTS) - Learning of Berkhart's new identity, Norman Osborn offered Mad Jack a million dollars to coerce Jameson into selling his controlling interest in the Daily Bugle. Remembering how Jameson left him in a clutch years earlier, he eagerly accepted. (Spectacular Spider-Man II#241) - Mad Jack began his attack by spying on Jameson while he worked late hours at the Daily Bugle. (Spectacular Spider-Man II#242) - A short time later Mad Jack tracked Jameson back to his apartment, watching him while he spent time with his wife, Marla. (Spectacular Spider-Man II#243) - Mad Jack tracked down Jameson's son John near the Ravencroft Institute (where he served as Chief of Security) and threatened him. Wounded from an earlier attack by the Chameleon and in no mood for threats, John pulled out his firearm and blew off Mad Jack's head. Recovering in seconds, Mad Jack disarmed Jameson and doused him with mind-controlling chemicals (administered through candle wax poured over his head). John was later found by Ravencroft Director Dr. Ashley Kafka, who unexpectedly kissed Jameson while Mad Jack watched from afar. (Spectacular Spider-Man II#244) - Mad Jack continued to observe John Jameson and Kafka when they left Ravencroft to track down the escaped Chameleon. (Spectacular Spider-Man II#246) - Turning his attention to J. Jonah Jameson, Mad Jack ambushed him at the Daily Bugle and savagely beat him. (Spectacular Spider-Man II#248 (fb) - BTS) - Mad Jack unmasked himself to a beaten Jameson, but doubted if Jameson had any recollection of the reveal given the severity of his attack. (Spectacular Spider-Man II#247) - Hovering outside of Jameson's hospital room, Mad Jack was spotted by Spider-Man who quickly engaged him. Using Maguire as a distraction while he regained his bearings, Mad Jack employed a series of illusions to disorient Spider-Man while he fled. Encountering Spider-Man outside the hospital a second time, Mad Jack used reality altering illusions and mind-controlling chemicals to defeat Spider-Man; having no particular issue with the webslinger and appreciating the distraction, Jack lowered him to safety before leaving. Taking note of Jack's odd mention of a distraction, Spider-Man leapt into Jameson's room where he found a mind-controlled John attempting to smother his father with a pillow. (Spectacular Spider-Man II#248) - Hypnotising Jameson's police guards, Mad Jack entered Jameson's hospital room. Explaining that his attacks weren't personal but rather that he'd been hired to attack him, Jack told Jameson that the cost of his family's safety was the Daily Bugle. Leaving the hospital, Mad Jack entered Jameson's apartment, leaving with a book of poetry from Marla Jameson's nightstand. (Spectacular Spider-Man II#248/Spectacular Spider-Man II#249) - Jack brought the book to Jameson, who, fearing for his wife's safety, agreed to sell control of the Daily Bugle to Osborn. (Spectacular Spider-Man II#248) - Meeting with Osborn to update him on the developments with Jameson, Mad Jack set fire to Osborn's payout to him, and when told there might be more work for him in the future told Osborn to "go to Hades". (Spectacular Spider-Man II#257/Spectacular Spider-Man II#258 (fb) - BTS) - A short time later Osborn hired Mad Jack to rescue Suifindian ambassador Hazram Chaliz's daughter Tabriaz when she was kidnapped by Conundrum as part of a plot to obtain the mystical Hand of Mumthazi. (Spectacular Spider-Man II#257) - Making his grand entrance at the Metropolitan Museum's "Wonders of Ancient Sufind" exhibit, Mad Jack stole the Hand to draw Conundrum out and returned to his hideout in the old Maguire's pub. Tracked down, Mad Jack explained to Conundrum his desire to rescue Tabriaz and his willingness to turn over the hand to do it. Mocked for both his foolishness in giving up a valuable artifact like the Hand and "reducing" himself to mercenary work, Jack attacked Conundrum. Their brief skirmish was interrupted by neophyte hero Prodigy (secretly Spider-Man), prompting Mad Jack and Conundrum to team-up to handle their mutual foe. (Spectacular Spider-Man II#258) - Failing to snare Prodigy in an illusionary trap, Mad Jack fled, leaving Conundrum to be taken into police custody. 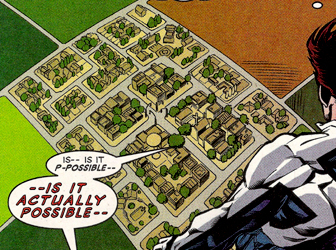 The location of Conundrum's secret lair subsequently revealed, Mad Jack followed Prodigy while threatening to unleash the powers of the Hand against him; before he could use the Hand's alleged power however, Jack was shot in the back by one of Osborn's bodyguards. Believed dead, Mad Jack later met with Osborn to accept payment for his services in rescuing Tabriaz, noting that his "assassination" gives him the freedom to operate free of interference. (Amazing Spider-Man II#8/Spider-Man: Mysterio Manifesto#3/Official Handbook of the Marvel Universe A to Z Vol. 8 (Mysterio (Berkhart) (fb) - BTS) - Berkhart chose to honor his deceased master by taking up the identity of Mysterio once more, while handing the Mad Jack identity over to Maguire. (X-Man#57 (fb) - BTS) - Berkhart trained himself in archaic mind-control and hypnosis techniques. (Amazing Spider-Man II#12/2 (fb)) - Berkhart recounted Quentin Beck's career as Mysterio to an unseen audience, suggesting that Beck's suicide may have been an illusion or that in death Beck transcended to another level of unforeseen power. (Amazing Spider-Man II#8/Spider-Man: Mysterio Manifesto#1 (fb) - BTS) - A few weeks after Beck's suicide, Mysterio, obsessing over Spider-Man true identity, began kidnapping people associated with his nemesis, including Peter, Mary Jane, and May Parker, J. Jonah and Marla Jameson, and Joe "Robbie" Robertson. (Amazing Spider-Man II#6 - BTS) - Mysterio kidnapped Eugene "Flash" Thompson from his apartment. (Amazing Spider-Man II#7/Amazing Spider-Man II#8 (fb) - BTS) - Mysterio trapped his abductees in a virtual reality fantasy world. (Amazing Spider-Man II#7) - Spider-Man (secretly Mysterio) and Thompson acted as adventurers alongside the Fantastic Four in the VR scenario, saving the world from the threats of Dr. Doom, Annihilus, and Blastaar. (Amazing Spider-Man II#8) - A wheelchair bound Peter Parker (left in this state after being bitten by a radioactive spider years earlier) exposed Mysterio's deception, unmasking Spider-Man as Quentin Beck and removing his costume to ally himself with Thompson against a virtual barrage of his rogues gallery. 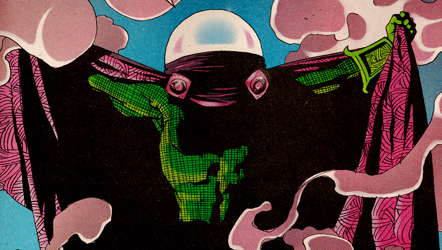 Boasting of improvements to his armaments (while suggesting these skills were honed in battle against Daredevil), Mysterio revealed the virtual reality scenario was a ploy to learn his secret identity. Overpowered by Thompson's desire to free himself and his friends, Mysterio fled, swearing that he'd learn Spider-Man's secret once day. (X-Man#57 (fb)) Disguised as Quentin Beck, Mysterio abducted Spider-Man associate Nate Grey (X-Man), believing that he would reveal Spider-Man's secret identity. Setting Grey up in a large scale VR environment populated with illusions resembling Grey's friends and enemies, Mysterio also had a mesmerized Grey commit a series of bank robberies to recoup the expenses for the illusion. (X-Man#56) - Mysterio observed Grey's progress in Greyville, disappointed by the lack of progress with his main objective, the uncovering of Spider-Man's secret identity. In spite of that failure, Mysterio felt satisfied with his financial gain and opted to cut his losses. (X-Man#57) - Believing he'd killed an "actor" made up like the Purple Man, Grey began collapsing Mysterio's illusion. As it continued to fall apart, Grey realized that Mysterio's "actors" were another illusion. Gathering himself, Grey went after Mysterio's control room. Trying to disorient Grey by creating duplicates of himself and sending him through a myriad of realities, Mysterio confronted Grey face-to-face, using his mind-control to seemingly absorb Grey's power. While Mysterio believed he'd gained the power to remake the world, Grey actually placed Mysterio in a telepathically crafted imaginary scenario. (Official Handbook of the Marvel Universe A to Z Vol. 8 (Mysterio (Berkhart) (fb) - BTS) - Mysterio eventually escaped from Grey's trap. (Amazing Spider-Man II#12 (fb) - BTS) - Continuing the pretense that he was Quentin Beck, Mysterio began faking suicides to further the illusion. Mysterio later received a notice from the Sandman, former criminal partner to Beck who'd recently resumed his criminal career after having his mind forcibly tampered with by the Wizard. (Amazing Spider-Man II#12) - "Conjuring" a thunderstorm from the top of the World Trade Center, Mysterio soon attracted Spider-Man. After restoring the weather to it's earlier blue skies and sunshine, Mysterio fell from the roof to his seeming demise; for attempting to save him, Spider-Man was blamed for Mysterio's death by onlookers. Responding to Sandman's request at the Criminal Bar with No Name, Mysterio again faked his death before regathering himself and inquiring about Sandman's intentions. Told Sandman wanted to form another Sinister Six, Mysterio showed disinterest before learning that U.S. Senator Stewart Ward and his associate Dr. Octopus were their targets. (Peter Parker: Spider-Man II#12 (fb) - BTS) - Mysterio and Electro formed a secret partnership that had an unusually vicious Electro following Mysterio's direction. (Amazing Spider-Man II#12) - Tracking Dr. Octopus down at the Senator Ward's Manhattan office, Mysterio created the illusion of a ninja hoard following Six member Kraven the Hunter, and of giant vultures following the eponymous Six member. (Amazing Spider-Man II#12/Spider-Man: Mysterio Manifesto I#1) - Joined by their final member Electro, Mysterio and his partners went after Dr. Octopus, founder of the original incarnation of the Sinister Six years earlier. 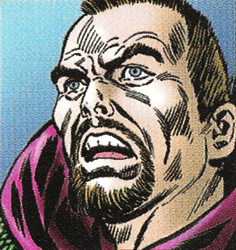 (Amazing Spider-Man II#12) - Mysterio avoided commenting on Octopus's realization that he wasn't Quentin Beck, and instead surrounded him and the Senator with a gas cloud. (Peter Parker: Spider-Man II#12) - Joined by Venom (rounding out the Sinister Six to six actual members), in-fighting led to Ward, Dr. Octopus, and Spider-Man escaping. His recent "death" questioned by Venom, Mysterio remarked on his delight over the confusion but steered the conversation back toward their goal of eliminating Ward and Octopus. Told that if Venom would join their ranks he'd be paid out of Mysterio's share, Sandman led the others back to their pursuit, soon locating their prey alongside private investigator Arthur Stacy (there to kill Ward himself). Forced to fight both Spider-Man and Venom, who turned on his teammates when told he wouldn't be able to kill Spider-Man (his sole reason for joining the Six), Mysterio was hit with a blast of energy from Ward, whose infection with an alien Z'Nox virus began to dangerous flare up. Telling Electro to neutralize the threat, Ward's powers faded, but Sandman, Vulture, and Kraven -- injured from Ward's blasts and in no condition to fight -- made a fast getaway. Mysterio and Electro however spirited Ward away in the confusion, bringing their target to an unidentified party. (Amazing Spider-Man II#17) - His latest warehouse lair tracked down, Mysterio created an illusion of a dystopian Manhattan to deter both Sandman, who wanted revenge against Mysterio for allowing Venom, who later mortally wounded him, into the Sinister Six, and Spider-Man, who had been trailing Sandman. Attacking them alongside Electro, Mysterio fled when Spider-Man pulled the warehouse's roof down with webbing, disrupting the illusion. (Peter Parker: Spider-Man II#17) - Recovering, Mysterio and Electro regrouped on a nearby rooftop and discussed the implications of Venom's revenge on his former teammates. Assured that Venom would be dealt with, Mysterio left Electro to deal with their mutual foe (who just moments later badly injured Electro). (Spider-Man: Mysterio Manifesto#2/Official Handbook of the Marvel Universe A to Z Vol. 8 (Mysterio (Berkhart) (fb) - BTS) - Mysterio reteamed with Maguire Beck to avenge Quentin Beck against his enemies Spider-Man, Daredevil, and J. Jonah Jameson, and Beck's childhood friend Betsy "Betty" Schneider, who parlayed her connection to Beck into a mini-merchandising empire. To aid in their plot Mad Jack constructed robot doubles of Beck and Berkhart to pose as Mysterio and herself, respectively. Maguire, taking up the identity of Mad Jack, had become increasingly unstable following Beck's death however and found herself believing Berkhart was her cousin, eventually forgetting her recent association with Berkhart completely. (Spider-Man: Mysterio Manifesto#1 - BTS) - Commencing their plot against Beck's foes, Mysterio and Mad Jack sent a Spider-Man illusion to attack Daredevil while Mad Jack abducted Jameson. (Spider-Man: Mysterio Manifesto#1) - Remaining silent while Mad Jack expressed her delight at the progression of their plan, he seemingly shot her a look that reminded her of their plans against Schneider and her husband, Joe Smith. Mysterio watched as Mad Jack attacked Spider-Man and Daredevil with robotic bats, a fight that ended with Spider-Man trapped in an illusion of an idyllic home-life. (Spider-Man: Mysterio Manifesto#2) - Remainging motionless, Mad Jack told her partner to lighten up and stop giving her a "fish bowl stare". Reminding Mysterio that Spider-Man, Daredevil, and the rest would pay for the pain they caused "him", Mad Jack believed this made him smile. While Spider-Man, Daredevil, and Smith were placed in illusion-producing stasis tubes (similar to the kind used on Spider-Man's friends months earlier), Mysterio and Mad Jack watched their Beck and Berkhart automatons torment Schneider and Jameson. Apologizing for failing to inform her partner about her Berkhart double, Mad Jack began wondering what ever became of him, her belief that Berkhart was Beck strengthening. They later watched as Spider-Man, Daredevil, and Smith freed themselves from the "happy tanks" and met up with Schneider and Jameson, only to be surrounded by scores of their arch-enemies. (Spider-Man: Mysterio Manifesto#3) - Continuing to silently observe the attack, Mad Jack told Mysterio to smile, "his" revenge at hand. 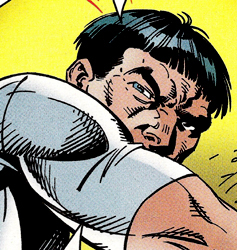 As the fight began to turn in the heroes's favor once their power-negating chemicals had the opposite effect on the formerly-super-empowered Smith, Jameson revealed that Danny Berkhart unmasked himself as Mad Jack to him, prompting Spider-Man and Daredevil to discuss the possibility that Berkhart also became Mysterio again after Beck's suicide and has been posing as a resurrected Beck to show off his illusionary prowess. (Spider-Man: Mysterio Manifesto#3/Official Handbook of the Marvel Universe A to Z Vol. 8 (Mysterio (Berkhart)) - As Mad Jack confronted the heroes only to meet a swift defeat and have the truth of her identity exposed, Mysterio left, leaving his partner to her fate in the wake of her growing madness. (Spider-Man: Get Kraven#1/2/Official Handbook of the Marvel Universe A to Z Vol. 8 (Mysterio (Berkhart) (fb) - BTS) - Seeking to better acquaint himself with New York's super-villain community, Mysterio began frequenting the Bar with No Name. (Spider-Man: Get Kraven#1/2) - Sharing a drink with several unidentified super-criminal patrons of the Bar with No Name, Mysterio was present when Spider-Man arrived to meet with Alyosha Kravinoff. A fight among the bar patrons broke out, all of them trying to get a piece of Spider-Man. When Kravinoff entered the fray to protect his girlfriend, a waitress at the Bar, his presence tipped the fight in Spider-Man's favor and the villains were left to lick their wounds. (Official Handbook of the Marvel Universe A to Z Vol. 8 (Mysterio (Berkhart) (fb) - BTS) - Mysterio avoided becoming involved in the brawl. (Marvel Knights Spider-Man#6) - Attending the Tinkerer's auction for the Venom symbiote, Mysterio openly questioned Eddie Brock's alleged altruistic reasons for getting rid of the symbiote when all be he'd doing is handing it over to another psychotic super-villain. The cancer-ridden Brock replied that the symbiote was going find a new host anyway -- at least this way he can give the money from the auction to charity. (Spider-Man Unlimited III#7 (fb) - BTS) - Mysterio encountered Spider-Man while committing an unrevealed crime (referring to his actions as a "performance" and his crime as a "great drama"). (Spider-Man Unlimited III#7) - Crashing into the Merx Phramaceutical offices, Mysterio grabbed Merx employee Amanda and threatened to blind her as a way of avenging himself against Spider-Man. Shockingly, Mysterio's helmet was shattered by Amanda's stapler-wielding co-worker Jake, whose intervention gave Spider-Man a chance to defeat his illusion-casting foe. (Official Handbook of the Marvel Universe A to Z Vol. 8 (Mysterio (Berkhart) (fb) - BTS) - Taken into custody, Mysterio soon escaped his imprisonment. (Friendly Neighborhood Spider-Man#11) - Via surveillance concealed in the warehouse, Mysterio watched Klum don the Mysterio attire. (Friendly Neighborhood Spider-Man#12 (fb) - BTS) - Mysterio watched news coverage of Klum's assault against Spider-Man at Midtown High School where the wall-crawler worked as a teacher in his recently outed civilian identity. Donning a redesigned costume, Mysterio left to confront Klum. (Friendly Neighborhood Spider-Man#12) - Arriving at Midtown High to supposedly offer assistance to nearby law enforcement officers, Mysterio passed through Klum's barrier surrounding the school and found Klum in the middle of a confrontation with Spider-Man. (Friendly Neighborhood Spider-Man#13) - After some verbal sparring, the two Mysterios began attacking each other with illusions until the fight fell in Berkhart's favor. Complimenting Klum's natural talent and telling him he might have considered taking him as an apprentice if he weren't so untrustworthy, Mysterio moved into to finish Klum off. Stopped by Spider-Man, Mysterio was defeated by the wall-crawler after a brief fight. (Friendly Neighborhood Spider-Man#13/Official Handbook of the Marvel Universe A to Z Vol. 8 (Mysterio (Berkhart) (fb) - BTS) - Spider-Man left Mysterio to be taken into custody; neither learned that a seemingly demonically reborn Quentin Beck (missing the section of his head lost during his suicide) had been in the school that day as well, nor that Klum had been badly wounded by Midtown High nurse Miss Arrow (Ero). 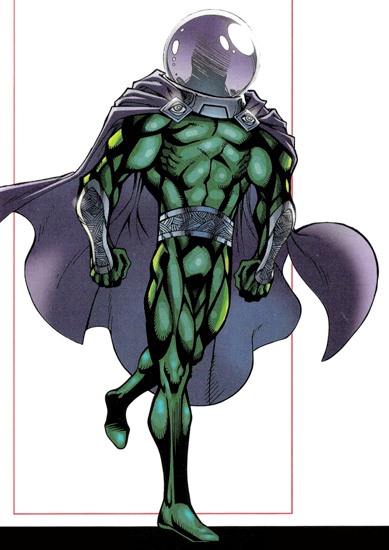 Mysterio received profiles in the Official Handbook of the Marvel Universe: Spider-Man 2005 and the Official Handbook of the Marvel Universe A to Z Vol. 8; the former was a shared profile for Berkhart and Quentin Beck. 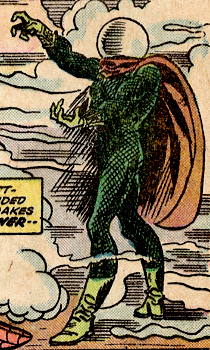 While a number of the mysteries surrounding Berkhart's stints as Mad Jack and Mysterio were explained in the Spider-Man: The Mysterio Manifesto mini-series and various profiles from the Official Handbook of the Marvel Universe, his appearance lurking around the residence of Peter and Mary Jane Parker remains unexplained. Still, with all of the bits that have been revealed, that detail can probably be overlooked (but if you really wanted to tackle it, you could say that the Mad Jack Mary Jane saw was a hallucination). 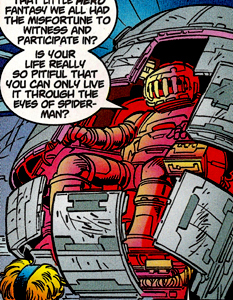 During his encounter with Conundrum in Spectacular Spider-Man II#257, Berkhart refers to their old master's death. While it's possible this follows Beck's suicide in Daredevil II#7 (despite some necessary rejiggering of the timeline if that's the case), it seems more likely that they were referring to Beck's death in a metaphorical way. Regardless, in their respective handbook profiles it's confirmed they were discussing Beck, so what was meant by referring to him as being dead remains unrevealed. It's suspected in the Francis Klum profile that the Jack O'Lantern who sold Quentin Beck's warehouse to the Kingpin was Maguire Beck. This is supported by Berkhart's surveillance of the warehouse, which he would've likely had in place regardless of his current relationship with Maguire. Quentin Beck has since resurfaced in Amazing Spider-Man I#618-620, where he proclaims he's "Beck from the dead" and indicates his return is part of a long-term scheme going as far back to his suicide years earlier. While it's possible Beck faked his suicide, it fails to explain his posthumous appearances in X-Statix Presents: Dead Girl and the aforementioned Friendly Neighborhood Spider-Man. Looking back at the stories following Beck's suicide (and the confusion that ensued) it kind of seems cheap to bring him back and say he was never dead in the first place. As someone who followed those stories back in the day, I'm operating under the assumption that Berkhart is pretending to be Beck to back up his 'death-faking' business with the Maggia -- how better to convince clients it works than to suggest you've been benefiting from it. When asked about it during a convention panel, Dan Slott, writer of the arc featuring Beck's comeback, indicated that this may well turn out to be the case; either way, if Beck is back for good I hope Marvel doesn't forget that ol' Danny Berkhart is still running around out there. (X-Man#57 (fb)) - Continuing his plot to learn Spider-Man's secret identity, Mysterio abducted Spider-Man associate Nate Grey, trapping him in an environment called "Greyville". As part of the Greyville illusion, Mysterio populated it with illusions of Grey's friends and family, including Spider-Man, Threnody, Madelyne Pryor, Cable, Jean Grey, and Forge. (X-Man#56/X-Man#57) - While Grey believed he was watching "Mr. Smith Goes to Washington" at the Greyville Drive-In theater with Threnody, Pryor, and Spider-Man, he was actually being used to commit a bank robbery. Mysterio enhanced the illusion by having the police officers that opposed Grey's spree appear in the illusionary world as fictional movie monster Ecco: The Sludge that Swallowed Secaucus. (X-Man#56) - While the battle with Ecco raged on, Violet, Agent of S.H.I.E.L.D. arrived to explain Ecco was sent on her behalf as a result of Greyville refusing to sell their land to her "firm" (opting instead for a literal hostile takeover). With Threnody's assistance Ecco was defeated and it's form, made up of scores of roaches, scattered when Violet was knocked unconscious. Returning home to his family farm, Grey helped his "father" Forge work on machinery, while his "mother" Jean Grey and "brother" Cable had lunch. Their quiet moment interrupted by a purple-skinned Mr. Sinister, Jean was struck down, soon followed by Forge who was impaled on one of Sinister's extending fingers, and finally Cable, who was killed by the electrical feedback of Sinister's force-field. Told by a dying Forge to seek out Spider-Man, Grey instead took on Sinister himself, quickly tearing his form apart and curiously finding a diminutive, frightened man inside. Flying above Greyville, Grey realized he was in an illusion. As Greyville faded from existence, Grey noticed a bunker, and recalling Violet and Sinister's purple hue, suspected the illusion was created by Killgrave, the Purple Man. (X-Man#57) - Attacking Killgrave, Grey brought his bunker down on them, killing the Purple Man. Realizing that the Purple Man's complexion was make-up, and faced with the reality of having killed an innocent man, Grey soon realized he was actually in a dome on the ocean floor and his environment was being created by hundreds of hovering holo-mirrors. Spotting a group of frightened actors made up like his friends, Grey was spoken to by an unseen Mysterio who revealed how he captured Grey and used his illusions to convince him he was fighting enemies while he robbed bank safes and vaults. Paying little attention to Mysterio's words, Grey remained focus on the man he killed, his anger over losing control of his powers causing the destruction of the holo-mirrors and cracking the dome. As water flooded in, Mysterio's actors cried for help, but he was only able to save Threnody before the others drowned. He soon realized the actors were actually illusions, the realization causing Threnody to fade from sight. (Amazing Spider-Man I#141) - During his second assault against Spider-Man, Mysterio created the illusion of an attack from a number of Spider-Man's enemies. The illusionary villains, including the the Green Goblin (Norman Osborn), Tarantula (Rodriquez), the Vulture (Toomes), Dr. Octopus (Octavius), Molten Man, the Jackal, Hammerhead, the Grizzly (Markham), Morbius, and the Lizard (Curtis Connors), vanished during Spider-Man's failed attempt to subdue them, a fight that instead left his hands bruised and bloodied from punching a brick wall. (Amazing Spider-Man I#142) - Planting an image inducer on Spider-Man, Mysterio convinced him that the Kingpin (Fisk) was going to attack him in his apartment, and later that Mindworm, the Jackal, Morbius, the Green Goblin (Norman Osborn), the Vulture (Toomes), the Lizard, and Dr. Octopus (Octavius) were advancing against him. (Amazing Spider-Man II#8) - Trapping a number of Spider-Man's friends and associates in an elaborate virtual reality scenario to discover his secret identity, Mysterio, his plot unraveling, created dozens of Spider-Man's villains to stop his enemy from foiling his scheme. 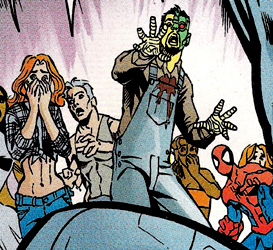 Despite their numbers, the villains provided little challenge to Spider-Man and Flash Thompson. 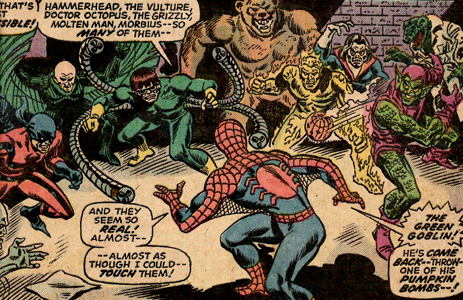 The Spider-Man villains created by Mysterio during this encounter included Kraven the Hunter (Sergei Kravinoff), Dr. Octopus (Octavius), the Beetle (Jenkins), the Green Goblin (unidentified), the Tarantula (unidentified), the Vulture (Toomes), Electro (Dillon), Venom (Brock), the Hobgoblin (Macendale), the Kingpin (Fisk), Hydro-Man, Sandman (Baker), Hammerhead, the Rhino (Sytsevich), Carrion (unidentified), the Chameleon (Smerdyakov), Tombstone, the Shocker (Schultz), the Ringmaster (Maynard Tiboldt), Rocket Racer (Farrell), Silvermane, and the Scorpion (Gargan). (Spider-Man: The Mysterio Manifesto#2) - Teaming with Mad Jack in a plot to avenge Quentin Beck against Spider-Man, Daredevil, J. Jonah Jameson, and Betsy Schneider, Mysterio created illusions of Spider-Man and Daredevil's rogues and adversaries. 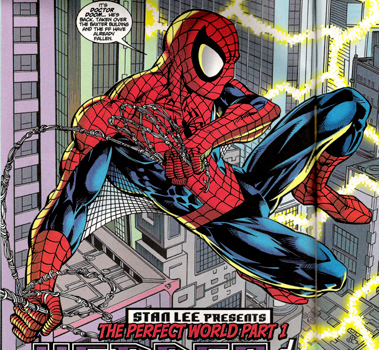 The Spider-Man villains created included Hammerhead, the Burglar, the Vulture (Toomes), the Kingpin (Fisk), the Green Goblin (unidentified), Kraven the Hunter (Sergei Kravinoff), Sandman (Baker), Electro (Dillon), the Rhino (Sytsevich), Scorpion (Gargan), Dr. Octopus (Octavius), and Molten Man (seen in the following issue) in addition to Daredevil opponents Mr. Fear (unidentified), Slade, the Owl (Owlsley), Fixer (Sweeny), Bullseye (Lester), Typhoid Mary, Nuke (Simpson), the Jester (unidentified), several members of the Hand, Gladiator (Potter), Elektra, and the Punisher (Castle). (Spider-Man: The Mysterio Manifesto#3) - The rogues gallery illusion took advantage of the heroes' temporary loss of their powers, but found themselves at a disadvantage when Mysterio's power-negating chemicals had the opposite effect on Schneider's husband Joe Smith, restoring his super-strength lost years earlier. With Smith's assistance, the illusions were defeated.